Unexpected power surges and voltage spikes can damage or destroy your expensive electronic devices. 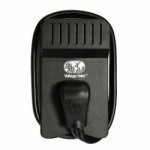 Take along the protection you need with Voltage Valet’s Travel Power Surge Strip. *The Travel Power Strip uses a grounded North American plug. A Grounded Adaptor Plug may be needed to connect to 220-240VAC foreign electrical outlets. See partial list below.